The concept of education has witnessed a major tectonic shifts over the past few years and to keep up with the trend, many schools have also upgraded the way they used to operate. Today, schools are not simply a premise to study, rather it has become a reliable place for grooming the children in the most effective manner. Although the technological advance mention the 21st century has contributed a lot to this process with improved level of communication, there are lot more to do for it. Most importantly, the school authority should resort to the perfect technology to achieve a fruitful end and in this regard eduWare certainly makes a wonderful solution. It’s one of the best software for school management that seek to streamline the process of school administration. This amazing school management software is cost-effective and facilitates convenient and seamless communication in the education institution. The technological advancement of the recent century has made us extremely dependent on machines. So is true for educational institutions as well. Hence, resorting to the highly-effective school management software has become a trend. Broadly speaking, this school administrative software is a program comprising of a huge database of system that seamlessly controls the daily operation and functioning of the school without any manual intervention. While keeping a real time record of every transaction, this software electronically store all kinds of information including the data pertaining to students, staffs, teachers and various strategies and policies of a school. Normally the software runs on Cloud technology that offers remote access. Admin Module – Undoubtedly an indispensable part of a school management software, admin module in eduWare helps keeping all the operational and administrative details of the school without any manual intervention. It includes, keeping the records of the students as well as the teachers and other staff, and the day-to-day operation of the institution including recruitment’s. Attendance Module – Essentially dedicated to the students, attendance module in eduWare deals with the attendance of the students. It helps in keeping the daily attendance of the students and stores it in the database, so that it can be retrieved for future use. Admission Module – This is undoubtedly, one of the most vital parts of the software. Admission process itself is outright hectic and going manually often leads to several mistakes and inconveniences. eduWare’s seamless admission module not only helps in hassle-free admission, but also reduces the chances of mistakes in the process. Student Module – Designed to keep the record of the students, this module of eduWare deals with everything of a student, right from his admission, his percentage, attendance and day-to-day activities. In addition to that, it deals with the marks and grades of the students, that in turn helps in generating report cards and other certificates for each students. 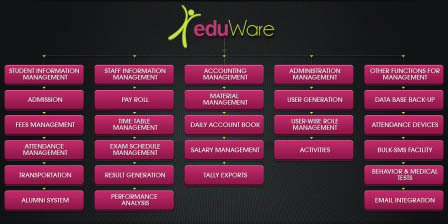 Employee Module – eduWare’s employee module is focused on the details of each employee, be it a teaching or non-teaching staff. It includes a detailed overview of their joining and tenure details. It also manages the leave each of them is taking and the designation of each employee. Since the salary is automatically calculated in the software, the salary slip is also generated without any manual labor. Parent Web Portal Module – It’s an user-friendly interface that eases out communication between teachers and parents. Parents can come up with different questions and concerns about their children and can get it sorted out from the teachers. In the parent web portal parents can see their child information like division, standard, absents date and results etc. Parents also compare the child marks with other student in graphyicalway. In short, it’s an interactive platform for parent, teacher and student engagement that seek to create better learning experience for the students.